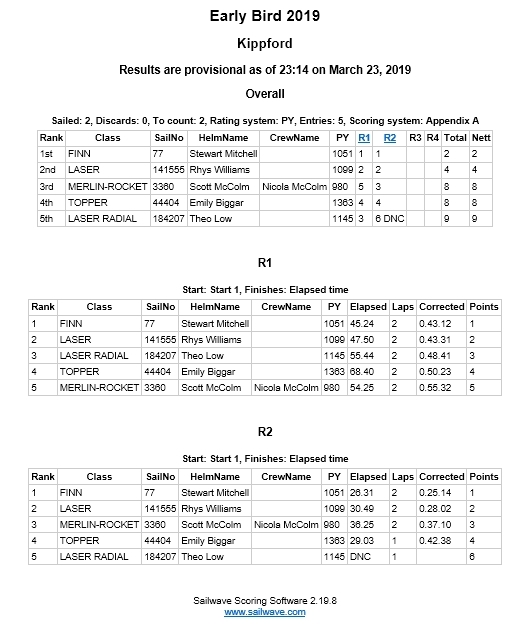 The first racing of the season was run in fairly decent conditions for the time of year with tolerably bright skies and a wind that was just enough to keep boats moving over most of the course. Five boats were out and, although the fleet was quite strung out at times, the handicaps meant that the racing was quite close. Better winds are forecast for tomorrow (Sunday) so hopefully a good turnout will enjoy some good racing. 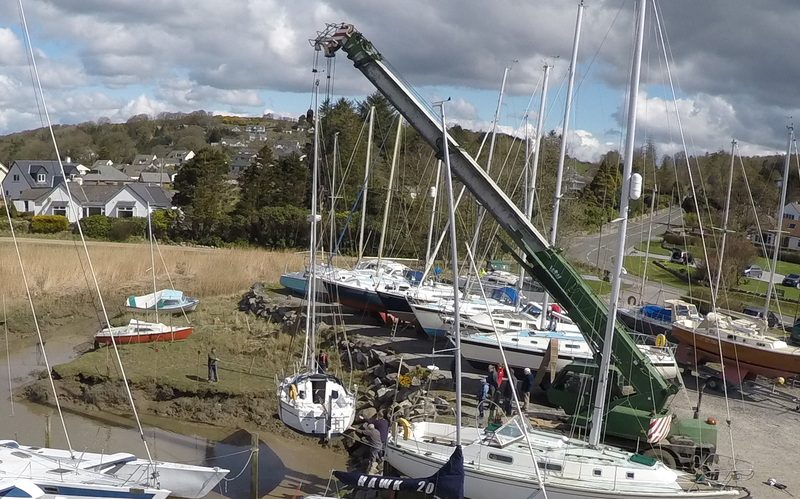 Craning in is just around the corner, on Saturday 6th April to be precise. If you would like to have your boat go in that day, would you please let Steve Taylor know as soon as possible. Remember too that bookings for the supper in the evening close on Wednesday 3rd April to allow the chefs to cater for the right numbers. See Webcollect for full details. Here is the first part of the Programme for 2019. Things are getting going soon so please check the dates and the duties if you are a race officer or Safety Boat Driver. The personnel columns do not take account of any swaps arranged after Dutyman was populated. 16th March - a work party to get the club boats ready for the season. There's a lot to do so a big turnout would be good. We especially need cadets who know the mysteries of rigging dinghies but also adults to tend to many other tasks. 17th March - Safety Boat Familiarisation and Race Officer Reboot. Pete Hammond and Chris Nurney will be leading sessions for those on the duty list and for anyone who would like to join the merry throng. As the rugby guys and gals say "nae referee, nae game" so we always need volunteers. 23rd March - Start of the dinghy season. Get some points on the board now. Sunny and warm weather with a fine south-westerly almost guaranteed (please note though that the Commodore is not in charge of weather). 6th April - Craning In. Speak to Steve Taylor or Lindsay Tosh if you want your boat craned in. Jim is booked with his crane. 6th April - To mark the start of the season, Poppa and Dom have exceeded even their past exploits and there will be a wonderful supper centred round a selection of roasts. Booking is via Webcollect and there is both a limit on numbers and a closing date of 3rd April so now is the time to book. Book here. Look for Events on the right hand side of the Webcollect page. 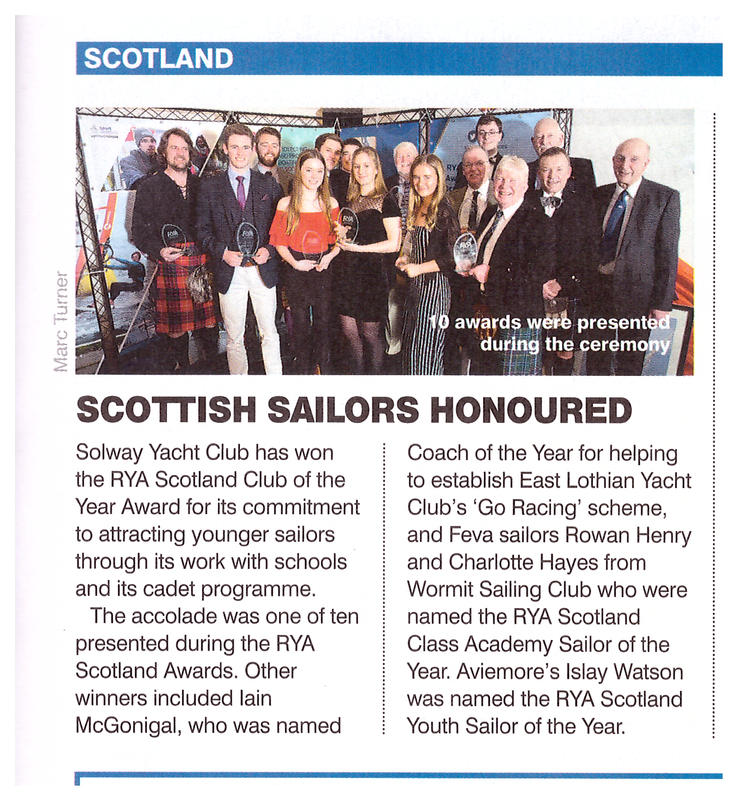 The club came away from the RYA Scotland Awards evening with one direct success and one indirect. The trophy for Club of the Year was brought home to Kippford and the honour was all the sweeter when you consider the quality of the other two clubs on the shortlist; Royal Northern and Clyde YC and East Lothian YC. East Lothian now head for London as a shortlisted club for the UK awards and we wish them well. Our one time cadet captain Jock Wishart was successful in the competition for Performance of the Year. Jock took the trophy with his Commodore's Cup team, who went to Cowes and came back not only victorious but very clearly the top team. Jock was kind enough to mention the club in his acceptance speech. One thing we learned was that, should you be at a Burns Supper and Jock is addressing the Great Chieftain o' the Puddin Race, you'll hear and see a lively address; just keep out of claymore range! See Jock in full cry on the Facebook page. Bookings are now open on Webcollect for the Prizegiving Supper on Saturday 26th January. There is no charge but the puddings are on a bring and share basis. See the attached poster and Webcollect for more details. Further information is also on the club's Facebook page. Remember too that there's a photo competition running and it will be judged on the day. 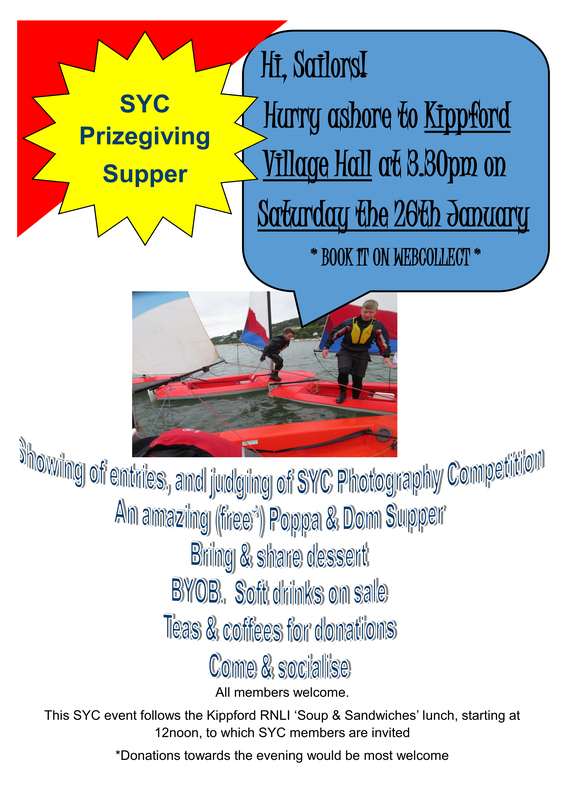 The supper follows the RNLI event earlier in the day and members are welcome there too. Lindsay echoed the comments when accepting his election as the incoming Commodore, keen to develop these links further with the Club’s increasing involvement the the local “Active Schools” programme. As if anyone needed reminding, the Club has been enjoying much success in recent years and expanding its activities in training, racing, sail cruising off shore and power boating. So much so that the Club was nominated for “Club of the Year” in the 2018 Annual Awards run by the sport’s governing body, RYA Scotland. 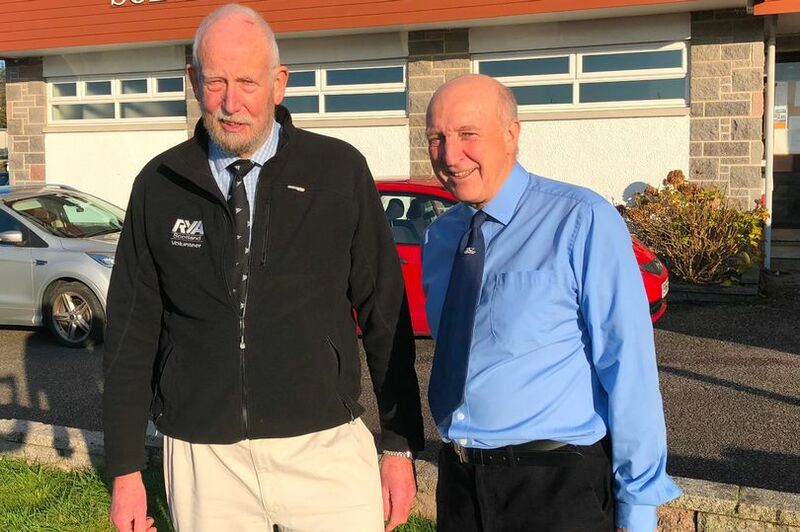 Marc Turner from RYAS arrived to congratulate the Committee with the news that the Solway Yacht Club has made the shortlist, the winner to be announced at a special event in January. More good news followed for Jock Wishart who was originally from Kirkcudbright, and, in his youth, a former Solway Yacht Club Cadet Captain. Over the years he has achieved great success not only in yachting but as an expedition leader with several polar adventures to his name. He had also been nominated and shortlisted for the RYAS 2018 “Performance of the Year” Award. 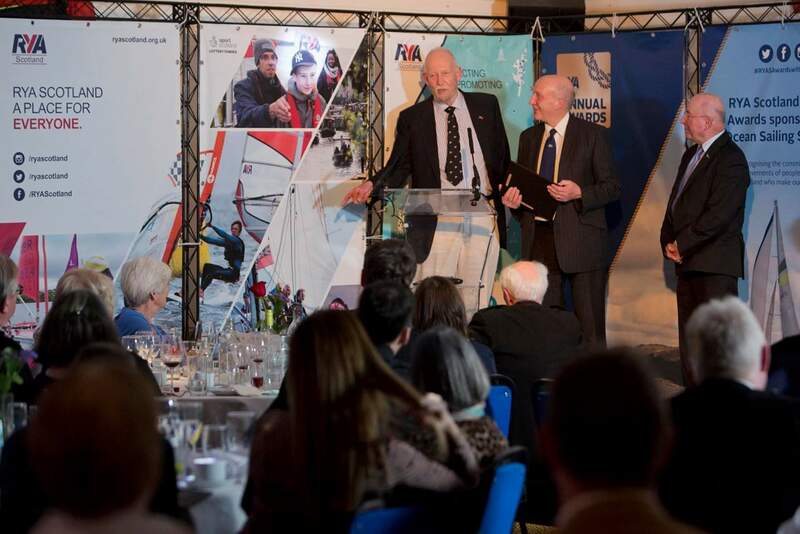 Earlier in the year, he put together and led the winning, all-Scottish team in sailing’s prestigious “Commodores Cup”; he was particularly proud of the fact that the international competition was held in English sailing’s home waters, in and around the Solent. “Jock’s Celtic Team” not only won, they won handsomely with the Netherlands team a distant second. The AGM also gave Club members the opportunity, which they took with great pleasure, to elect both Gordon and Liz Daly as Honorary Members. As the husband and wife team they have given enormous service to the Club over many years. Gordon, a retired Master Mariner, in accepting the Honorary membership, commented how grateful he’s been for the Club’s very existence, having first joined in 1953! Congratulations to Gordon and Liz!